Raghavendra Swamy was not only a man of miracles but also a writer of exceptional ability. He was a brilliant scholar and a orator. His works are so important in the Madhwa pantheon, that he is called Madhwa Mathambodhi Chandra (The moon shining from the ocean of Madhwa Siddantha).The language is simple and the flow of thought like a wave. He is credited with having written more than forty works, including commentaries on Vyasa Raja’s Chandrika, Vedas and the Prakarnas of Madhwacharya. Some of his works include Vedatraya Vivriti, Commentary on Pancha Suktas, Dashopanishat Khandartha, Geetartha Sangraha, Prameya Deepika Vyakhya, Geeta Tatparya Teeka Vivaranam, Tantra Deepika, Nyaya Muktavali, Tatwa Manjari, Tatwa Prakasika Bhava Deepa, Parimala, Dasa Prakarana Teeka Vyakhya, Rama Charitra Manjari, Krishna Charitra Manjari, Tatparya Nirnaya Bhava Sangraha, Vaadavali Vyakhya, Chandrika Prakasa, Tarka Tandava Vyakhya, Pramana Paddhati Vyakhya, Anu Madhwa Vijaya Vakhya, Pratha Sankalpa Gadya, Bhatta Sangraha and Prameya Sangraha. A majority of his writing are commentaries on the works of Madhwacharya, Teekacharya or Jayatheertha and Vyasa Raja and of course the Upanishats. This, however, does not mean that he did not contribute anything original. There are many such works which are available even today. Raghavendra Swamy had taken a vow to write commentaries or tippanis for all the Teekas of Jayateertha or Teekacharya. When he had completed tippanis for 17 of the 18 Teekas of Jayateertha, his son Lakshminarayanacharya showed him his work on Rig Bhashya. Raghavendra Swamy was moved by the hard work and vigour with which Lakshminarayanacharya had written the commentary. He, therefore, abstained from writing the 18th tippani and instead held out Lakshminarayana’s work as an equally scholastic commentary. He then wrote “Rigartha Manjari”, a Vivritti, which gives the meaning of the first 40 suktas. He Veda Traya Vivruti is a commentary on all three Vedas (Rig Veda, Yajur Veda and Atharvana Veda), while the Purushasooktadi Panchasookta Vyakhyana is a commentary on Purusasookta, Gharma, Samudra, Pavamana, Hiranyagarbha and Ambhrni sooktas. Some of these are not available and there is only an oral tradition that he wrote these. The Khandarthas (Word by word meaning) give us information on nine of the ten Upanishats commented upon by Madhwacharya (except Aitareya Upanishad). Raghavendra Swamy was all set to write a commentary on Aitareya Upanishat, but he allowed his disciple, Smrutimuktavali Krishnacharya, to completed the work. He, therefore, wrote a gloss or a series of short notes on the mantra part of the Upanishat – Aitareya Mantraartha Sangraha. The Geeta Tatparya Teeka Vivarana is a commentary on Jayatheertha’s commentary of Madhwa’s Geeta Tatparya. 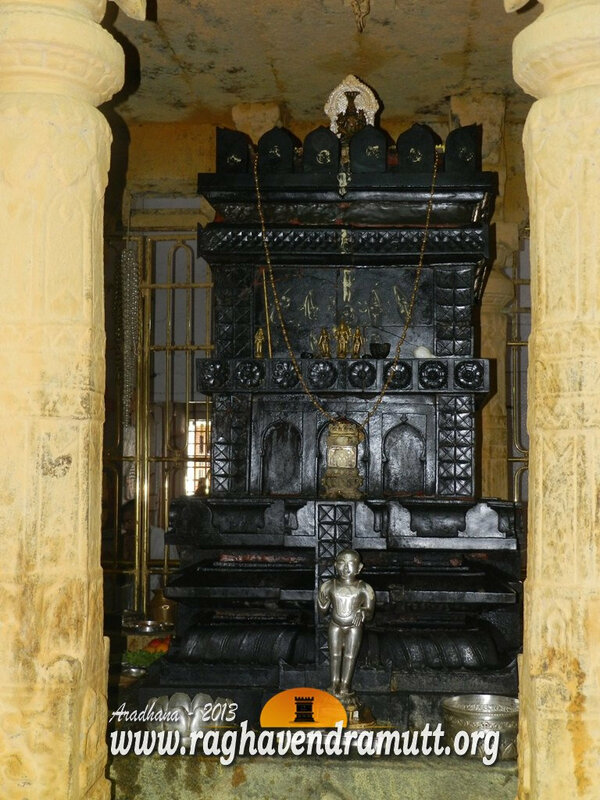 The Tatparya Chandrika is unique because Raghavendra Swamy explains his earlier works like Chandrika which he had written as avatar of Vyasa Theertha or Vyasa Raja. The Tatwaprakashika Bhavadeepa is an exposition on Tatvaprakashika, whis is Jayateertha’s commentary on the Brahma Sootra Bhashya of Madhwacharya. He has also written Tippani (notes) on Dasha Prakaranas and glosses on six of the ten Prakaranas of Madhvacharya. The Rama Chartirya Manjari highlights some of the important aspects of Rama and Krishna Charitrya Manjari similarly highlights major attributes of Krishna. is a short summary on the Mahabharata Tatparya Nirnaya written by Madhwacharya. Here, Rayaru has captured the essence of each Adhyaya in one verse. So the text has 36 verses, each corresponding to one chapter of Madhwa’s work. Similarly, the Vadavalee Vyakhya is a commentary on Vadavali of Jayateertha and the Chandrika Vyakhya a commentary on the Tatparya Chandrika of Vyasa Teertha Another commentary is on Tarkatandava Vyakhya of Vyasa Theertha. The Pramana Padhati Vyakhya is again a commentary on the book of same name by Jayatheertha and the Anu Madhwa Vijaya Vyakhya is a commentary on Anumadhwavijaya of Narayana Panditacharya. One of the best known works of Raghavendra Swamy is Prataha Sankalpa Gadya. This has to be recited every morning before one commences his work or task. Similarly, the Sarva Samarpana Gadya is an inspiring poem to be recited at night. Unfortunately, one work of Raghavendra Swamy-the Nyaya Deepika is not available. However, this is supposed to be a commentary on Madhvacharya’s Geeta Tatparya. The Bhatta Sangraha is a commentary on the Mimamsa sutras of Jaimini, following the Bhatta school. This is one of the very few works written by Dwaitha saints on other systems of thought. Nadi Taratamya stotra, Rajagopala Stotra and Dashavatara Stuti, all in Sanskrit, Indu Yenage Govinda in Kannada and Maruta Ninnaya Mahime, also in Kannada which is a Suladi.